Panel a: Observed gas-phase t-HCOOH emission integrated over the line profile after applying a Keplerian mask and smoothed at resolution equivalent to the TW Hya disk size. The contours and level step are at 3σ (where 1σ = 2 mJy beam−1 km s−1, in the smoothed and masked data). Panel b: Same as A but model. The synthesized beam is shown in the bottom left corner of panels A and B. Credit: Favre et al., 2018. Using the Atacama Large Millimeter/submillimeter Array (ALMA), an international team of researchers has detected formic acid in the circumstellar disk of the TW Hydrae system. It is the first discovery of the simplest carboxylic acid in a protoplanetary disk. The finding is reported in a paper published July 16 on arXiv.org. Located some 194 light years away from the Earth in the constellation of Hydra, TW Hydrae (TW Hya for short) is a T Tauri star less than 10 million years old, with a mass of approximately 0.7 solar masses. The star is assumed to be orbited by an ice giant planet at a distance of some 22 AU from it. TW Hydrae is known for its gas-rich circumstellar disk with a mass of more than 0.006 solar masses. The disk shows prominent rings and gaps in gas and dust emission, what could indicate an ongoing planet formation. Studying such disks as the one in TW Hydrae could provide essential information about planetary formation processes. It is crucial for astronomers to find out whether and what organic molecules are synthesized in protoplanetary disks as the chemical composition of these structures might shape the properties of the emerging planetary system. 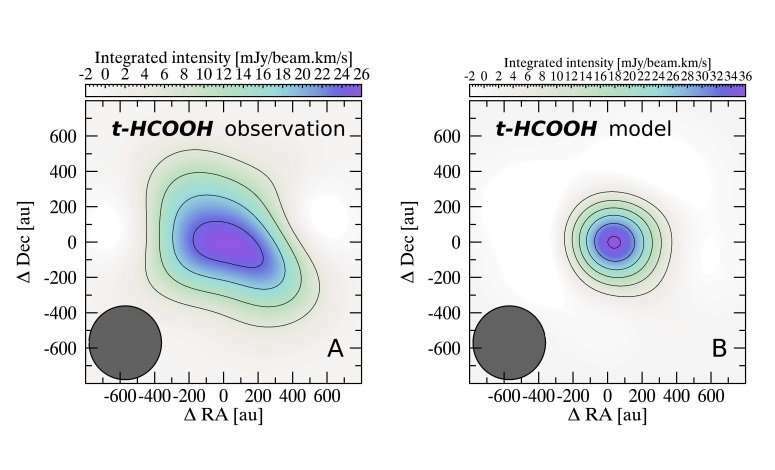 With that aim in mind, a team of astronomers led by Cecile Favre of the Arcetri Observatory in Italy conducted ALMA observations of TW Hydrae in mid-2016, focused on the detection of formic acid (HCOOH). It is the simplest carboxylic acid and key organic molecule as the carboxyl group is one of the main functional groups of amino acids. The observational campaign resulted in the discovery of the 129 GHz HCOOH line with a signal-to-noise ratio of about 4.0. "Here, we report the first detection of HCOOH with ALMA towards the protoplanetary disk surrounding the closest solar-type young star TW Hya," the researchers wrote in the paper. According to the study, the emission of formic acid in TW Hydrae appears to be centrally peaked with extension beyond 200 AU. The scientists added that although their low-resolution observations did not allow them to constrain where, exactly, formic acid is emitting within the disk, it is generally assumed that all organic oxygen-bearing molecules emit within the same region if they share grain-surface formation chemistry. Given that methanol (CH3OH), which is perceived as a starting molecule from which more complex organics are synthesized, was previously detected towards TW Hydrae, the researchers also calculated the fraction of formic acid with respect to methanol. They found that this ratio is not higher than 1.0, which is approximately one order of magnitude greater than the ratio measured in comets. Notably, the study conducted by Favre's team marks the first time when an organic molecule containing two oxygen atoms are detected in a protoplanetary disk. This, according to the authors of the paper, proves that organic chemistry is very active even though difficult to observe in disks.